The Toronto Maple Leafs possess great ability in the offensive zone. With heavy contributions from Auston Matthews, Mitch Marner, and most recently John Tavares, point production over the last two seasons has not been an obstacle for this young and vibrant hockey club. Alternatively, the Leafs’ defensive play remains subpar in their efforts to win hockey games. Poor positioning, missed assignments, lack of aggression, and miscommunication have already amounted to being tied for the second most goals against (GA) this season. Defensive responsibility must be realized by the entire club if this hockey team wishes to live up to the hype and realize their potential of being a Stanley Cup contender. Though it is easy to point out the drawbacks of the Leafs’ defence, understanding the key contributing factors may shine some light on how this team can fortify their defensive output. After all, the Leafs were projected to win the Stanley Cup according to Las Vegas oddsmakers. One can’t help but remain optimistic about Toronto’s ability to become a complete hockey team. As stated in The Art of Scouting by Shane Malloy, many National Hockey League (NHL) general managers feel that major junior draft picks lack the defensive knowledge and skill that will make them successful contributors at this level of hockey. To put it simply, these young players are often learning a ‘new game’ inside the game when they become professional hockey players. With such a young core, the Maple Leafs are experiencing growing pains as these players develop. This was most apparent in the 2018 postseason against the Boston Bruins. 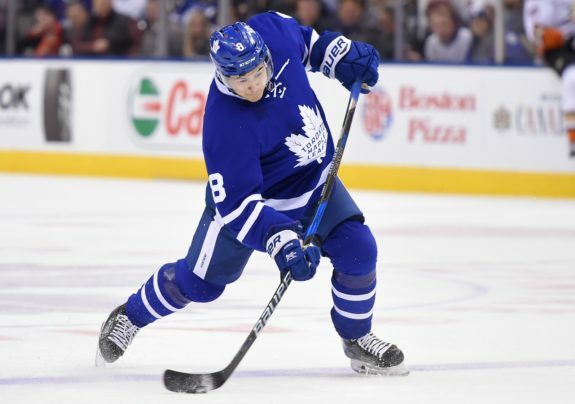 Watching multiple games in person, it was easy to notice the apprehension, hesitation, and – in some cases – panic displayed by Matthews, Marner, William Nylander, Nikita Zaitsev and others. With the exception of Connor Brown and Marner, the Leafs’ younger players would end their postseason run with glaring minuses. Experience will be the instrumental factor for these young players to improve defensively. In theory, it sounds almost too obvious. However, there are intricate components to ensuring the Leafs’ young guns refine their defensive capabilities. Veterans such as Ron Hainsey and Patrick Marleau are great mentors to learn from and provide perspective from both in an offensive and defensive mindset. Guiding them through practices and games will certainly aid in the confidence of these young players. Both Hainsey and Marleau have collectively seen the game transition over their storied careers and have a thorough understanding of what it takes for a team to be successful in the modern NHL. Hainsey won a Stanley Cup with the Pittsburgh Penguins in 2017 while Marleau has played 20 playoff campaigns throughout his career. Their experience will certainly be a beneficial sharing point for these young Leafs players. Coach Mike Babcock works diligently with all players of his hockey club. One trait that is fairly uncommon among NHL coaches is allowing players to make mistakes. Babcock’s teaching background must prove effective as he keeps reactions light when errors occur and takes the time to correct them. Not only does this approach aid in player development, it boosts morale and confidence amongst his team. Babcock must make defensive assignments as much as priority as offensive ones. Taking the time in practice and the video room to go over specific situations and eliminate poor defensive tendencies on both offence and defence. Has anyone ever noticed how tough Gardiner and Zaitsev are around their crease when an opponent is jamming away at Frederick Andersen? No, you have not. Sadly, this trait runs rampant throughout the entire Leafs’ defensive roster. This lack of aggression and physicality give teams a free pass to crash the net, cycle the puck and impose their will without any repercussions. It is time for the Leafs’ defence to play more aggressively in their defensive end. By hitting guys in the corners, punishing players for coming too hard into the crease, and being relentless on the check, the Maple Leafs will certainly deter teams from taking liberties against them. To clarify, this is not to insist upon dirty play or taking emotional penalties because someone on the other team did something you don’t like. Rather, it requires the implementation of more physical play, self-policing, pressuring puck-carriers and collective teamwork so other teams are more likely to be worn out and are pushed out of their comfort zone. This defensive aspect would give the Leafs a further competitive edge against opponents and result in pushing teams to the perimeter of the defensive zone. ‘Discipline’, the one word every hockey player has heard since they made it past house league. Coaches and even players at the NHL level are meticulous when it comes to discipline. Applying this characteristic to defence, its definition encompasses positioning, communication, and assertiveness. Defensive positioning seems to be a common hurdle for the Leafs. Players are easily drawn out creating lanes for opponents to exploit and generate offensive opportunities. 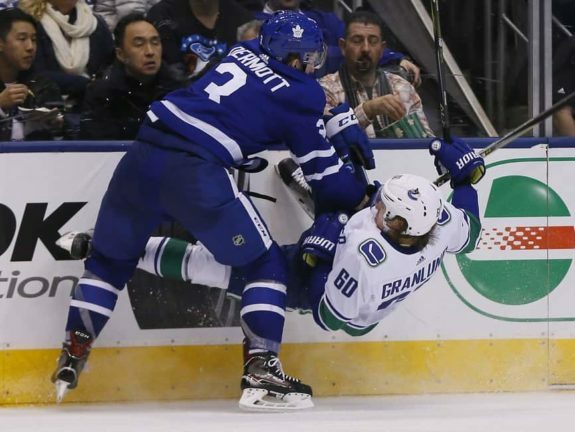 Former Leaf Connor Carrick was a victim of this continuously through the 2017-18 regular season. As the puck moved through the defensive zone, Carrick would overcommit to a player and be caught leaving a great amount of open ice for opponents to capture. By staying in the lower quadrant, supporting the offence, and protecting the crease, it would be hard to be caught out of position in the Leafs’ zone. Communication can certainly use improvement but is not a weakness for the Leafs. Improving on their existing communication could result in better positioning and assertiveness in the defensive end. Leafs’ defensemen are often heard clearly breaking the puck out of the zone or through the regroup but are less vocal when the other team has possession of the puck in their zone. More voices will help ensure the best decisions are being made as Leafs players will already have processed the information being communicated and see the ice better. Assertiveness is the final element of discipline. As Chris Wescott wrote about Buffalo Sabres’ Griffin Reinhart, being hard to play against is a competitive edge in itself. 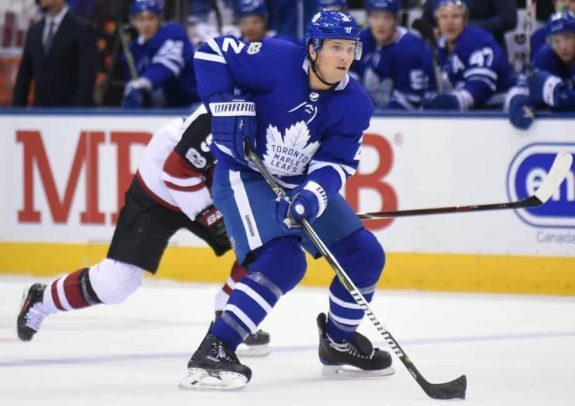 Gardiner is a prime candidate for being more assertive in the defensive zone as he often lets opponents take liberties on Andersen, coughs up the puck, and lacks physical play. Taking more responsibility in the defensive zone would certainly aid in his development as a defenceman. Clearing players out of the crease after the whistle, carrying the puck tight to his body, and hitting players with the puck along the boards would help round out his skillset. Being assertive in your own end dictates the style of play for the game. If the Leafs wish to command the tempo of the game, they will certainly need to take control of how the game is played in their zone. Not all aspects of the Leafs’ defensive play can be properly identified in this article. These outlined factors serve as a foundation to which this club will be able to achieve success and remain durable past the regular season of play. It is still early in the season and only time will tell if this squad of young talent will be able to develop into a complete hockey team.